RICHMOND, Va. (AP) — The new special agent in charge of the FBI's Richmond, Virginia, field office was the lead FBI agent in Special Counsel Robert Mueller's office. BOSTON (AP) — The Boston office of the FBI has a new leader. FBI Director Christopher Wray on Monday named Joseph Bonavolonta special agent in charge of the office, which oversees Massachusetts, Rhode Island, Maine and New Hampshire. WASHINGTON (AP) — The director of the FBI says the partial government shutdown is "mind-boggling, it's short-sighted, and it's unfair." MEMPHIS, Tenn. (AP) — The FBI says a new special agent has been named to head the field office in Memphis, Tennessee. FBI Director Christopher Wray said in a statement Wednesday that M.A. "Mo" Myers will serve as the special agent in charge of the Memphis Field Office. Myers entered the FBI in 1996 and was first assigned to the Miami Field Office. He worked in counterintelligence and served on the SWAT team there. FBI Director Christopher Wray has selected James "Robert" Brown Jr. to serve as special agent in charge of the FBI's Louisville Field Office. The Kentucky Republican says the new FBI office in Paducah will be beneficial in responding to drug-related crimes and any crisis situations in the region. McConnell had contacted FBI Director Christopher Wray to advocate for the office. SALT LAKE CITY (AP) — A Utah Navy veteran confessed to sending four envelopes containing the substance from which ricin is derived to President Donald Trump and members of his administration, authorities said in court documents. DENVER (AP) — An Iranian man living in Colorado has filed a federal lawsuit against U.S. Attorney General Jeff Sessions and other federal officials, claiming they are violating law for failing to conduct a citizenship interview. BEIRUT (AP) — Lebanon says FBI Director Christopher Wray has expressed support to the Lebanese army during a visit to Beirut. A statement released by the presidential palace in Beirut said President Michel Aoun received Wray on Friday and told him that Lebanon has succeeded in fighting terror groups thanks to U.S. support and that of friendly countries. NEW YORK (AP) — FFBI Director Christopher Wray visited the World Trade Center Friday to urge current and former federal agents to file claims if they think their health was affected by the Sept. 11 terror attacks. 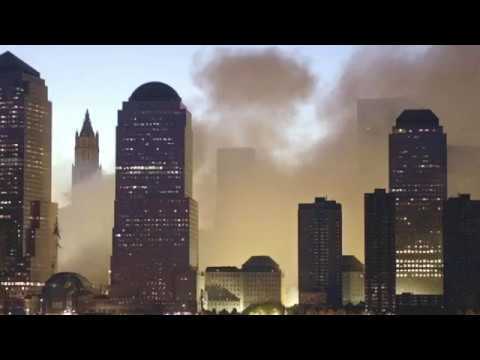 FBI agents were among the thousands of rescue and recovery personnel who rushed to the Trade Center, the Pentagon and Shanksville, Pennsylvania, after the 2001 attacks. ASPEN, Colo. (AP) — FBI Director Christopher Wray said Wednesday that Russia continues to use fake news, propaganda and covert operations to "spin up" Americans on both sides of hot-button issues to sow discord in the United States. 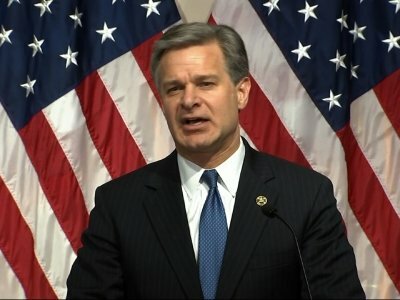 Wray stood behind the intelligence agencies' assessment that Moscow meddled in the 2016 presidential election, dismissing Russian President Vladimir Putin's claim that his country was not involved. WASHINGTON (AP) — Republicans accused top federal law enforcement officials Thursday of withholding documents from them and demanded details about surveillance tactics during the Russia investigation in a contentious congressional hearing that capped days of mounting partisan complaints. Justice Department Inspector General Michael Horowitz says the people working for the FBI cannot be perfect. ATLANTA (AP) — The director of the FBI says the agent who headed the bureau's Atlanta office is "in a better place" following his death from exposure to contaminants years earlier when he responded at the World Trade Center on 9/11. Asked before a private meeting with the president of South Korea if he has confidence in Rosenstein, who is overseeing the special counsel's Russia investigation, he asked reporters to move on to another question. The White House says a briefing for congressional leaders with top FBI and Justice Department officials will happen on Thursday. The purpose is to review highly classified information the lawmakers have been seeking on the handling of the Russia investigation. FBI Director Christopher Wray blamed politicians for the recent criticism that has been heaped on the bureau, saying outside of Washington, the agency's brand "couldn't be higher." The FBI was more interested in forcing Apple to unlock the San Bernardino shooter's cellphone rather look at other options in a time-sensitive investigation, a group of bipartisan members of Congress said Friday. In a letter to FBI Directory Christopher Wray, the representatives said the bureau was more interested in squeezing Apple than cracking the case. President Donald Trump and Republicans have criticized the FBI as institutionally biased against their party and urged Director Christopher Wray to clean house. But the executives announced Friday are longtime FBI employees with vast experience in the bureau's highest echelons. 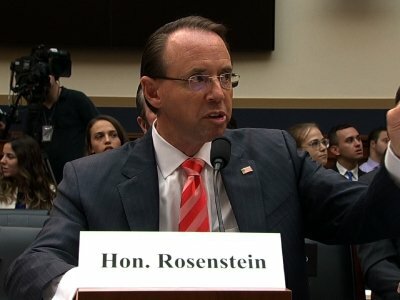 The Justice Department has handed over all of the documents requested by the House intelligence committee after a congressman threatened to impeach FBI Director Christopher Wray and Deputy Attorney General Rod Rosenstein over the delay. A Justice Department official said the documents, which were related to the FBI's probe of the Trump campaign's contacts with Russia, were turned over Wednesday. Mr. Nunes, California Republican, also appeared to issue a deadline of Wednesday evening, warning: "It will get really complicated after that." WASHINGTON (AP) — President Donald Trump is accusing the Justice Department of "slow walking" its release of documents related to the FBI's handling of the Hillary Clinton email investigation. In two Saturday tweets, Trump slammed the department overseen by his appointees for delays responding to Republican lawmakers' document demands. Trump asks, "What does the Department of Justice and FBI have to hide?" and says the agencies are "stalling, but for what reason? Not looking good!" CHESTNUT HILL, Mass. 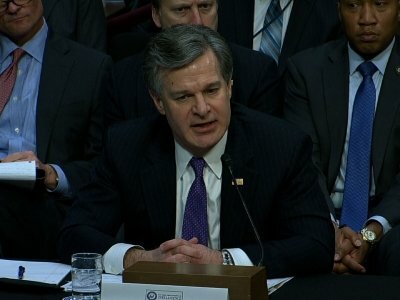 (AP) — FBI Director Christopher Wray is coming to Massachusetts to discuss cyber threats and challenges. Wray will be the keynote speaker Wednesday at the second annual Boston Conference on Cyber Security at Boston College. GALLUP, N.M. (AP) — FBI Director Christopher Wray met with tribal officials of the largest Indian reservation in the U.S. this week, becoming the first head of the federal law enforcement agency to visit the Navajo Nation. His visit to the Navajo Nation was the first by a director and was intended to allow Wray to introduce himself to tribal leaders during a visit to FBI field offices, FBI spokesman Frank Fisher said. BEIJING (AP) — A top Chinese government spokesman on Friday dismissed concerns over Beijing's overseas influence as discriminatory, Cold War-era thinking, in a rare instance of a top official addressing growing negative sentiment in Western capitals, academia and media over China's covert reach. The horrifying news broadened two days after Nikolas Cruz, armed with an AR-15 entered Marjory Stoneman Douglas High School in Parkland and slaughtered 14 students and three teachers and injured several more. DETROIT (AP) — The FBI has appointed a new head of the agency's Detroit office. FBI Director Christopher Wray announced this week that Timothy Slater would serve as special agent in charge of the Detroit Division starting in March. Slater most recently served as the special agent in charge of the Criminal/Cyber Division at the Washington Field Office. CLEVELAND, Ohio -- Like President Trump's last 'Infrastructure Week' this latest 'Infrastructure Week' has been obscured by dust from more Trump administration dysfunction. It's now 'Porter Week' as the administration's spin on the Porter scandal crumbles, along with chief of staff John Kelly's credibility and job security. The FBI says it gave the Trump administration information on multiple occasions last year about a top aide accused of domestic abuse by his two ex-wives, and the investigation wrapped up in January. WASHINGTON (AP) — FBI Director Christopher Wray said Tuesday the agency provided the White House with information twice last year about the top Trump aide who resigned as staff secretary last week after domestic violence allegations from two ex-wives became public. 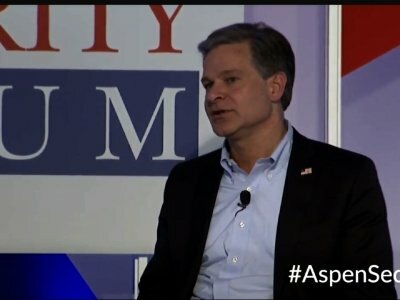 President Trump met Friday with FBI Director Christopher Wray and others to discuss releasing a 10-page Democratic memo that is a rebuttal to the Republican intelligence memo alleging FBI abuses of its surveillance authority. Mr. Trump huddled with Mr. Wray, principal Associate Deputy Attorney General Robert Hur and staff from the White House Counsel's Office "to receive their input" on the memo, said White House deputy press secretary Raj Shah. WASHINGTON (AP) — When President Donald Trump fired the acting attorney general last year for refusing to defend his controversial travel ban, Dana Boente stepped into the job. ATLANTA (AP) — The FBI director said Thursday that investigators haven't yet determined a motive behind the mass shooting at a Las Vegas country music festival, but they're still digging.